Myanmar’s opposition party led by Aung San Suu Kyi has officially won a majority of seats in Myanmar’s first openly contested general election in a quarter century, trashing the ruling military-backed government and giving it the power to both form a new government and choose the next president. Though there were clear indications that the National League for Democracy (NLD) was heading for a landslide victory in the November 8 election over the ruling Union Solidarity and Development Party (USDP) as early as Monday, observers were waiting for election results – disclosed in a series of rounds over the week – to clinch an unassailable majority of more than 329 seats. The seat total would give the party a strong control of both houses of parliament as well as the power to form a government and handpick the country’s next president. The magic number, 329, is derived from the fact that the opposition would need to win more than a two-thirds majority of the 491 contested seats in both houses (168 in the upper house and 323 in the lower house, with seven canceled in the lower house due to fighting among insurgent groups). A quarter of the 664 seats in both houses are reserved for the military according to the constitution. On Friday just after midday, figures disclosed by the Union Election Commission (UEC) confirmed that the NLD had finally surpassed that 329 mark. At the time of writing, the NLD clinched 348 seats for both houses, with the USDP winning just 40 seats. The NLD also scored 401 seats to the USDP’s 61 in state and regional assemblies. Moving forward, government officials have already made it clear that they will respect the results, easing fears of a repeat of the 1990 election where a landslide NLD win was ignored by the then-ruling junta which placed Suu Kyi under house arrest for more than a decade. Myanmar’s powerful army chief Min Aung Hlaing also separately said that the army would do its best to cooperate with the new government during the post-election period. Despite the NLD’s victory, the military will remain highly influential in the country’s politics. Myanmar’s constitution also bars Suu Kyi from becoming president, though the opposition leader has said she will seek to remain “above the president” following an NLD win. She also told Radio Free Asia in an interview that she found the government’s acceptance of defeat “politically honorable” and was willing to meet with any of the country’s current leaders to ensure a smooth transition. 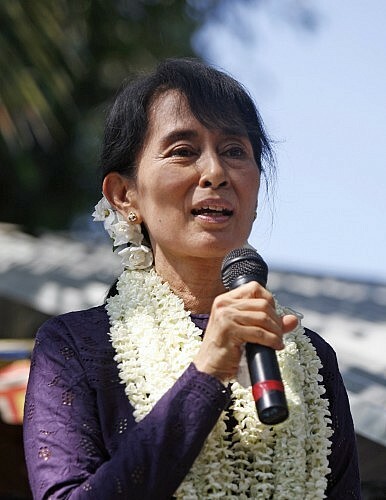 Yesterday, U.S. President Barack Obama called Suu Kyi to personally congratulate her on her campaign and the NLD’s success, noting that the election and the formation of a new government could be “an important step forward” in the country’s democratic transition. Around 30 million people were eligible to vote in the election, with turnout estimated at around 80 percent.